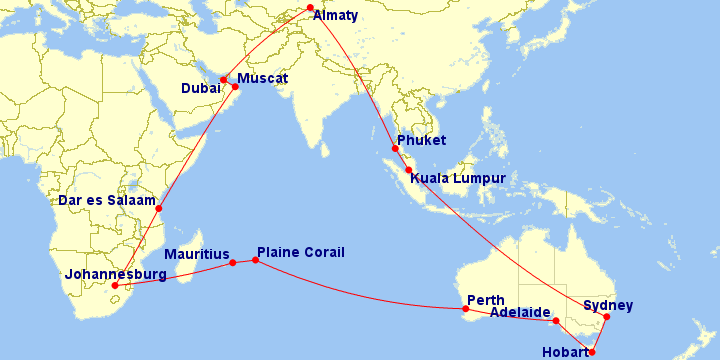 My scenic route from Oman to Australia, Tanzania and back! Zawadi wanted to spend the summer holiday in Tanzania with Amani and Malaika this year. I was long overdue for a trip to Tanzania too, but I also wanted to go to Australia. Since Zawadi and the children left a week or so before my leave started and because I was in no particular hurry, I decided to take the scenic route to Australia then Tanzania. So I flew to Dubai with Fly Dubai and then Air Astana to Almaty, Kazakhstan. I’ve long wanted to visit Central Asia and when I discovered that a one way ticket from Dubai to Kuala Lumpur with Air Astana was very reasonably priced, and that Kazakhstan was on the Smart-Traveller green list, decided to go for it. Almaty was interesting. It’s a clean and modern city, well worth a visit. I stayed just for 3 nights, at the Grand Tien Shan Hotel, a charming older accommodation that’s well situated near the Zenkov Cathedral and surrounding park and monuments. I’d be only too happy to return with the family one of these days and explore more of Kazakhstan. After a brief stop-over in Phuket just to break up the long journey (once I’ve been sitting in an aeroplane for more than 7 hours, I’ve had enough!) 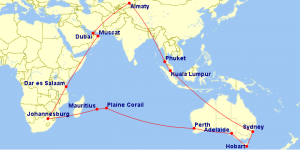 it was Malaysian Airlines to Sydney then Virgin Australia on to Hobart and then Adelaide to catch up with the family. It was such a treat to spend time with everyone. Next stop was Perth where I had the pleasure of spending a couple of days on the farm with my sister and her husband. It’s beautiful countryside down Donnybrook way. My next stop was another place I’ve long wanted to visit – the island of Rodrigues in Mauritius. I flew with Air Mauritius, via Mahebourg. I enjoyed Rodrigues very much. For me the highlight was the giant tortoise reserve. Needless to say, the island has some beautiful beaches. I stayed at the Auberge St Francois, a very pleasant and inexpensive lodging at the eastern end of the island. I then continued my westward journey, this time to Johannesburg, flying British Airways. I picked up my hire hire car and drove a little over 200kms to Pilanesberg National Park. This was where I had the most exciting adventure of the trip. No, not a close-up encounter with wild animals, but a thrilling ride on one of the longest ziplines in the world! The Zip2000 at Sun City is more than 2km long and speeds can reach 160kph – what a buzz! Combined with a stay at the Black Rhino Game Lodge, I enjoyed my brief South Africa visit immensely. The accommodation and facilities were excellent and the twice daily game drives exhilarating. Lions, elephants, hippos, rhinos, cheetahs, leopards, giraffes and more. I’ll definitely be back there again with the family one of these days. I think they’ll all love it. I certainly did. Next stop Tanzania! It was good to be reunited with Zawadi, Amani & Malaika. After I arrived, we spent a few days relaxing at Kipepeo, then we set off on our Tanzanian road trip. The 4WD we’d organised fell through at the last moment, so we had to change our plans a bit unfortunately. Originally we were going to drive from Dar es Salaam to Musoma via Arusha and the Serengeti, then return via Dodoma, but we had to stick to the bitumen since we only had a 2WD van. And so we drove from Dar to Musoma via Dodoma both ways. It was an interesting journey still. One of the highlights (and a very pleasant surprise) was the Malaika Beach Hotel at Mwanza. It was beautiful! We still managed a safari in the Serengeti, via the Ndabaka Gate on the western side of the park. We hired a Land Rover and guide/driver for the day. The kids loved it and we saw quite a lot of wildlife. Upon arriving in Musoma we were pleasantly surprised by the delightful views at the Matvilla Beach Lodge. The rooms were a bit rustic, but OK. The views however… wow! Stunning sunsets over Lake Victoria. The following day we drove from Musoma to Burere village, where Zawadi’s father lives. Owitti was very happy to see us and to have his grand children visit. Then the long drive back to Dar. During the entire journey we only had one flat tyre, and no major dramas along our 3,000km plus trip. The final pleasant surprise of the holiday was the Ramada Beach Resort in Dar es Salaam. It’s a really nice hotel – better than any other Dar hotels I’ve stayed in previously. After quite a long but very enjoyable trip it was time to head back to Muscat and back to work!